The schooner Ernestina; photo by Wildstar Beaumont on Flickr (noncommercial use permitted with attribution / share alike). From the National Park Service: "Built in 1894, the schooner ERNESTINA is the oldest surviving Grand Banks fishing schooner; the only surviving 19th century Gloucester-built fishing schooner; one of two remaining examples of the Fredonia-style schooners (the other being LETTIE G. HOWARD, also a National Historic Landmark), the most famous American fishing vessel type; the only offshore example of that type; and one of two sailing Arctic exploration vessels left afloat in the United States (the other being BOWDOIN, also a National Historic Landmark). 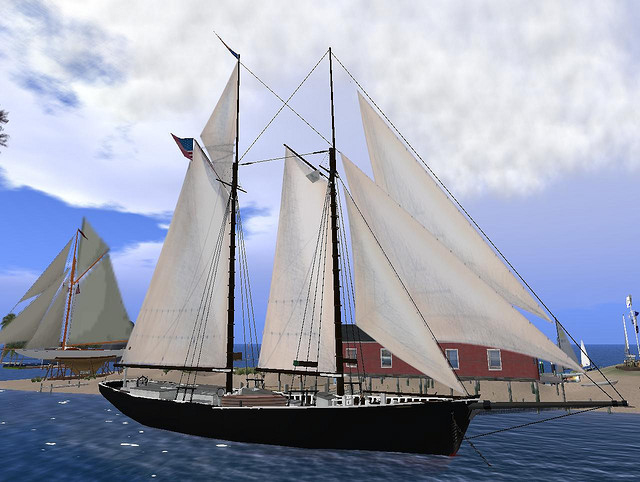 Today, ERNESTINA regularly sails the New England coast on educational cruises."